I have several original watercolors in my studio for sale. I have posted some images on my website for those who may be interested. 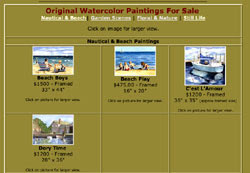 They are sorted by sections like Nautical and Beach Paintings, Still Life, etc. for your convenience. Most of my originals are framed and ready to hang. For more information, visit my Originals For Sale web page and click on an image you may be interested in. I will also have some of my newest work traveling with me to art shows this summer. My art show schedule is listed on the Events page of my website. There are a few paintings which are also traveling in exhibitions right now. They, too, are listed on my events page. Thanks for your support and interest!